While in our Gallery, volunteers attend to the space, interact with school groups, answer inquiries and provide information to patrons about the current exhibition. The Information Desk is an important hub of the Living Arts Centre and a focal point during events. Information Officers help direct guests, answer questions and provide visitors with a warm welcome and exceptional customer service. Outreach Ambassadors volunteers man the portable Marketing Booth during off-site events or performances at the Centre helping to promote the LAC. Reception Attendants provide excellent customer service assisting patrons both on the telephone and in-person in our Gift Shop. As members of the Front of House Team, Volunteers greet, direct, and seat patrons, monitor theatre entrances, assist patrons with special needs, prepare and distribute programs and count ticket stubs; providing “red carpet” treatment to our theatre patrons. Youth ages 15-18 can assist with our Camps, Weekend Courses, or Front of House. Complete your Community Service hours working with the public or children while having tonnes of fun! 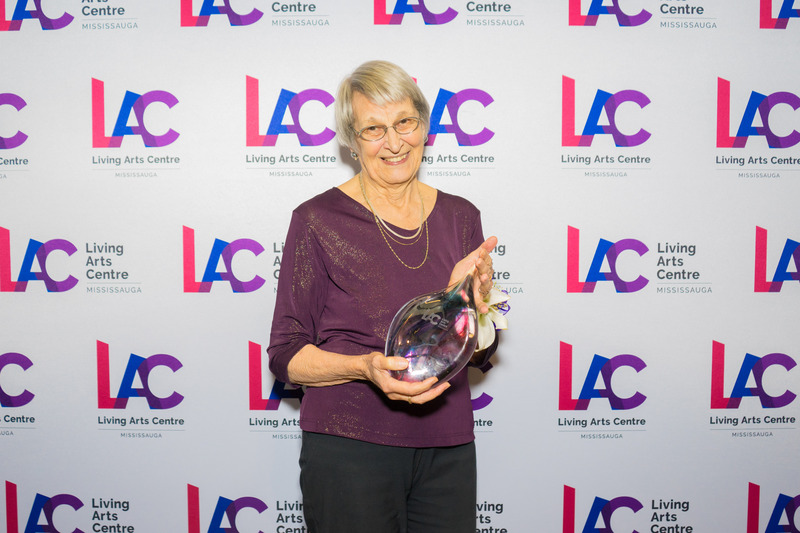 Why Volunteer at the Living Arts Centre? Get involved in the arts "behind the scenes"
Joanne has been with us for 22 years and is a very valuable asset to the Centre. She is part of our Outreach Ambassador team and has consistently come out to volunteer and promote the Living Arts Centre even before our doors opened in 1997. She is always eager to help out in any capacity she can with a smile on her face. We would like to thank Joanne for her extraordinary dedication and commitment to the Centre. Congratulations Joanne and keep up the great work!